A neuromuscular disorder called Friedreich's Ataxia has started to rob him of his ability to walk, talk, see and hear, but not his right to good friends and the very special moment his teammates planned for him at the end of Tuesday nights football game. PASCO COUNTY, Fla. — Tuesday nights River Ridge Middle School Knights game is one Gavin Lambert will never forget. He waited until the end of the 4th quarter for his big moment and under the bright lights he said, “It feels like an honor." "Most kids wouldn’t care, most kids would be like you’re in a wheelchair deal with that,” said Lambert. But these aren’t "most kids” and Gavin’s mom, Dawn Lambert, knows that. "It is a good feeling to know that your child is loved that much,” she said. His friendship with this entire football team started at the beginning of school and immediately eased her fears. "We were petrified of him starting middle school," she said. "I saw he was in a wheelchair and he was struggling to walk to his desk and it just made me sad that he couldn’t walk by himself,” said Noah St. Aubin. He and another player, Justin Hennessy rarely leave his side. 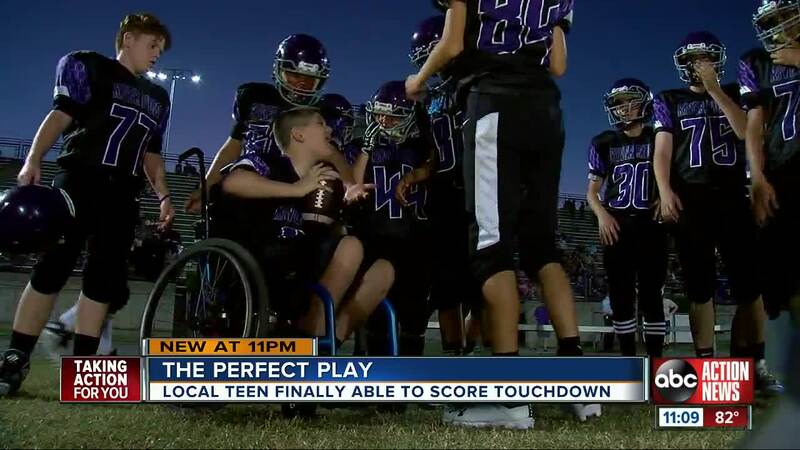 "You see those 37 points, that's you,” screamed a player after he made it into the end zone. Gavin isn’t just a football fan, he also enjoys basketball and hopes to join that team when he gets into high school.